A re-use plant may be established either with continuous addition of new water or batch exchange; the former is most common because it maintains stable water quality. 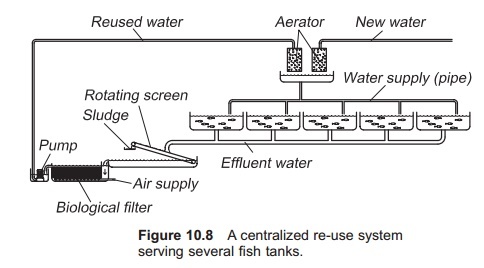 · Re-use system placed in a single fish tank, also known as a tank internal re-use system. Most current re-use systems are based on the centralized principle. Outlet water from all the fish tanks is colleted in a common pipeline that leads directly to one centrally placed water treatment system which includes all the necessary water treatment components. After treatment the water is returned to the tanks via a common inlet pipe (Fig. 10.10). Addition of the new water and removal of old water is also performed here, either on a continuous or batch basis. The advantage of a centralized system is that more investment can be put in the water treatment components because they handle more tanks and greater weight of fish. However, one disadvantage with this system is that if infection occurs in one tank it will be transferred via the water to all other tanks in the re-use circuit, although this can be eliminated or reduced by installing a disinfection plant in the circuit. Another disadvantage with a centralized water treatment system is that it is more difficult to gradually increase the size of the farm/system. In a single tank re-use system, the outlet water from the tank is lead directly into a water treatment system before it is returned to the same tank. Thus every tank has its own water treatment system and there is no mixing of water from different tanks. The water treatment system can either be an integral part of the fish tank, partly inside the tank volume, or it can be a separate external unit attached to the fish tank. Great flexibility is the major advantage with this system. It is easier successively to expand a fish farm. In addition, there are possibilities for better adaptation to individual loads, meaning that the degree of re-use can vary from tank to tank, and the single systems can in this way be operated optimally. The risk of spread-ing pathogens between tanks is also eliminated because there is no water connection between the tanks. The disadvantage is, however, the price, which inhibits development of the model. Each tank needs a separate water treatment system; this only allows use of low cost simple systems, but even then it is difficult to compete with centralized systems. The management cost of such systems is also increased because there are several units that have to be maintained and controlled; for this a larger monitoring system is needed. Such systems are not favoured when having high fish densities or very high percentage of re-use (>99.5%) because this normally includes several high cost steps, such as pH regulation, denitrification and disinfection. What is generally important when constructing a water re-use plant is that the components are compatible with each other and of the correct size. In addition to the water treatment components, it is necessary to establish a water flow in the re-use circuit; this is done by some kind of pump. Types used include airlift pumps, propeller pumps or centrifugal pumps. When using airlift pumps it is possible to combine aeration with the transport of water and by this eliminate the need for traditional pumps. In tank internal systems with a low degree of re-use this might be done to create a low cost system. In larger systems, traditional centrifugal pumps are most commonly used, because system efficiency is increased. The pump is either dry-placed or submerged. When using submerged pumps some heat will be transferred to the water from the pump, because the pump creates heat when running; when having a high degree of re-use this can contribute an important part of the total heating needs of warm-water species. In addition, the fish in the system will create heat from their metabolism, so the amount of heat that must be added is reduced even more.